Ministry of Propaganda - 31/Jan/2004: "Blogging abroad update"
That's enough for now. But I'm sure there will be another update soon. When writing this entry the weather was: Rainy. Stormy. Quite stormy and noise actually. Not abroad. But still away from home. 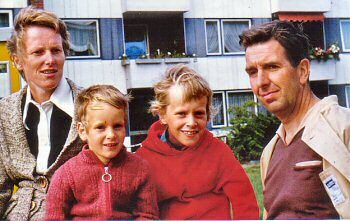 I believe this picture was taken on a visit to our aunt and uncle in Cologne in 1977. Which in those days probably was quite far away for us.